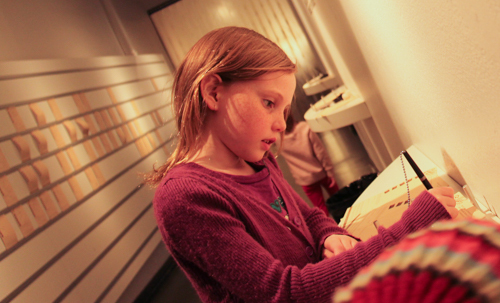 With it being immensely more appealing than a cheese factory, the girls were understandably excited about finally getting to visit a chocolate factory! 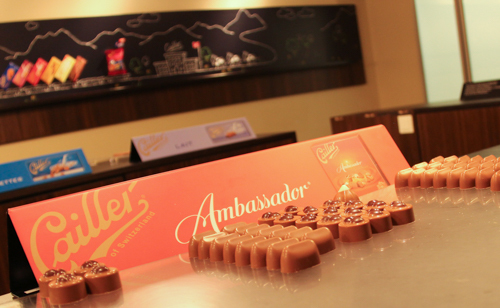 Maison Cailler is situated outside the village of Broc, also in the Gruyère region, and though when we visited, construction works were happening, it didn’t faze the steady stream of tourists who came to learn, taste and purchase from the name of the oldest chocolatier in Switzerland. Outside the white building that has become synonymous with the Cailler name, a shingled pod designed by French architect Mathieu Lehanneur serves as a boutique chocolate experience. 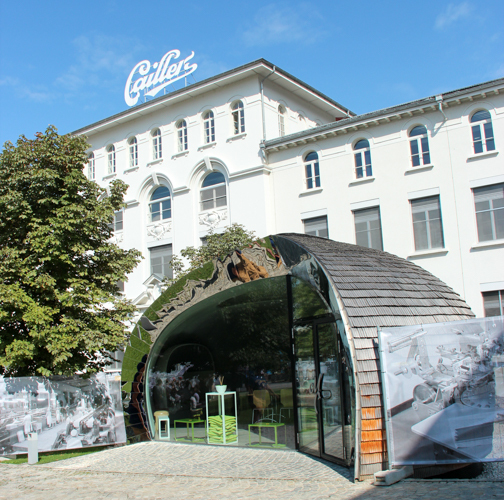 After François-Louis Cailler spent four years in Italy to learn the chocolate-making process, he moved back to Switzerland to open the first chocolate factory in 1819. In 1929, Nestlé purchased Cailler’s business and no doubt runs it as ruthlessly as it does all its other interests. 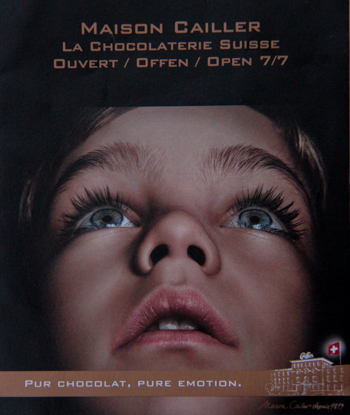 I researched intensively to find another (non-Nestlé) chocolate factory on our route, without any luck. So we went, although I still believe Nestlé is a corporate evil. Upon entering the building, you’re immediately in the gift shop. Surrounded by chocolate. Very clever. Before they noticed the chocolate, the girls were immensely excited by the large posters and brochures everywhere that displayed a girl’s face, as they thought it looked exactly like our beautiful Australian friend Tali! The procedure at Maison Cailler is to buy your ticket and receive an allocated spot in a tour of the appropriate language. Each tour is displayed on the TV. You have to watch for your number to come up then move to the waiting area until your group is called. While waiting — which could be a while as tour groups comprise only 20 people — you’ll have to find something to do … like browse the chocolate shop. Fancy some chocolate? I actually hadn't heard of the Cailler brand before, and with the extra time I can read all the ingredient lists on the back of the packages to identify if one is suitable for Brioni. 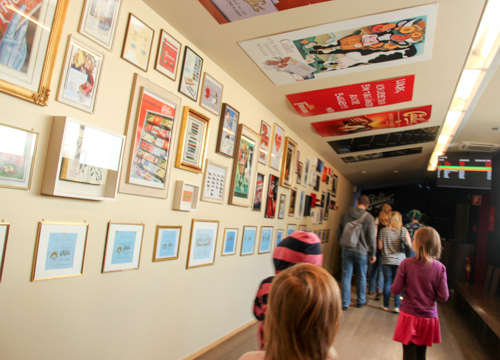 It's our turn, and as we head down the corridor, we're treated to a collection of vintage marketing posters. 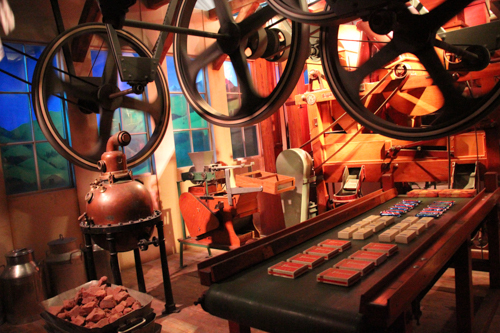 With dramatic effects, we start the story of chocolate in South America. 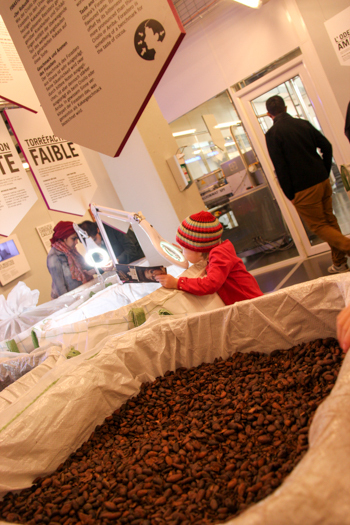 I wonder what the history of chocolate from a South American perspective would sound like. We're learning that soon after it was introduced to Europe by monks, the institutional church banned chocolate, stating that it incited lust. 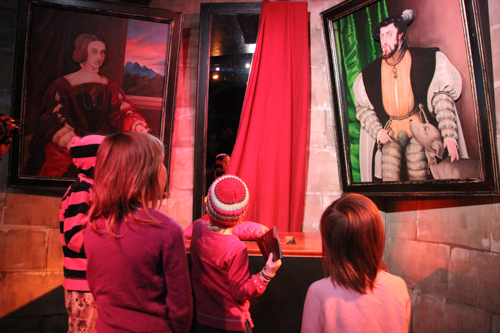 At many of the exhibits, the girls get up close so they can properly see the animatronics in front of the tableau. 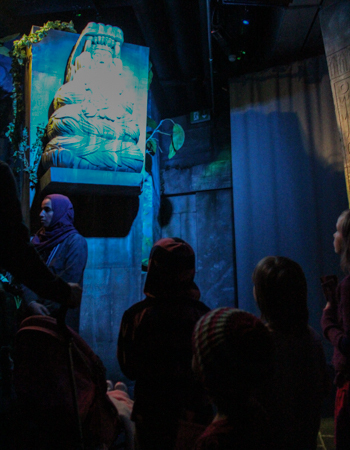 We pause at a display of an early factory set-up. 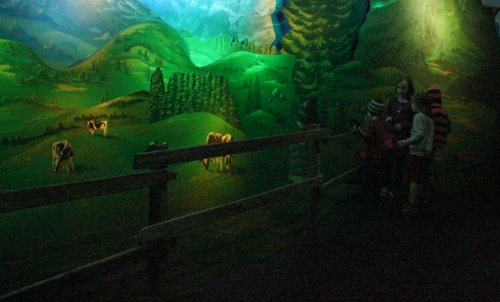 Each step of the tour is automatically guided by lights, recordings and opening doors. 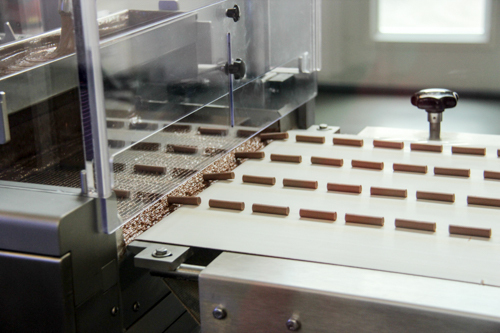 Once the pre-recorded historical tour is over, we’re left to work at our own pace through a series of rooms that are alongside a production line for Cailler’s Branch chocolate bars — tiny sticks of chocolate about four cm long. It’s fun seeing each step of the process in their manufacture! 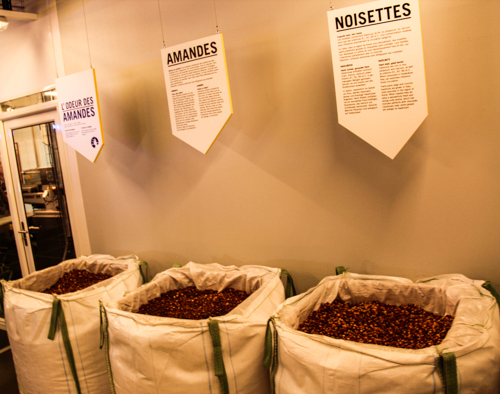 Just before we reach the chocolate factory displays, we're introduced to the ingredients that go into the chocolate, like these cacao beans. 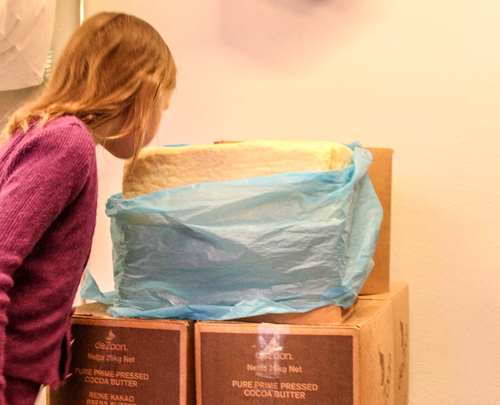 Aisha smells this block of cocoa butter that has been scratched and caressed by thousands of hands. Other bins hold the extra ingredients that garnish the chocolate. Possibly there are some visitors to the factory who haven't seen nuts before ... possibly. 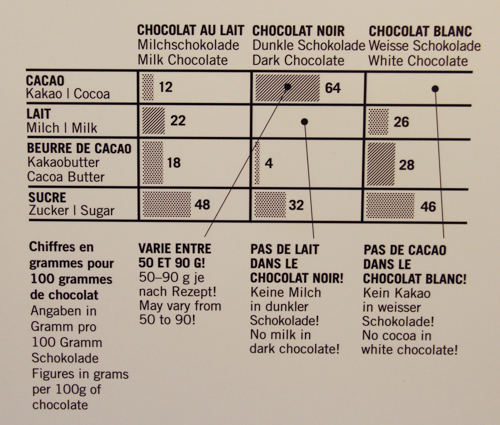 I find a handy guide to choosing chocolate for a vegan — at Cailler, anyway. 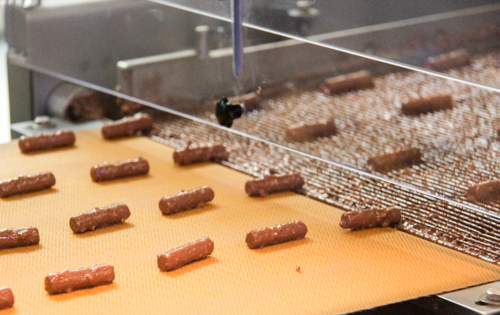 Rolled lines of chocolate are cut into the correct length and then move into a tray with a nutty coating. As they come through the gooey coating, we can see that each piece is evenly covered. This layer has to dry firm before they can be wrapped in individual packages. Once they're wrapped, the branches drop into a box. Every once in a while, the attendant empties a box onto a tray accessible to visitors. The girls eagerly reach for the chocolates, only to discover that they don't like these ones. But I do — the day is saved! 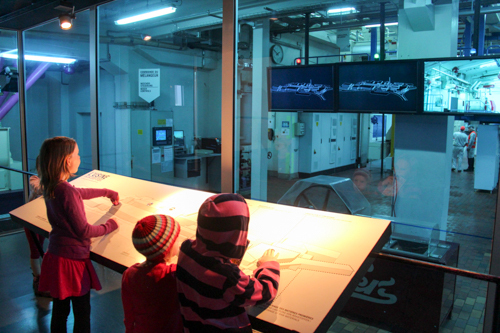 As we look into the milk-handling section of the factory, an interactive map of the site displays video showing what's happening in each part. 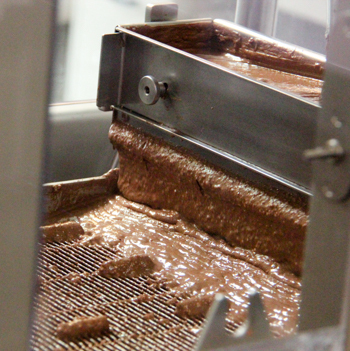 Cailler uses milk from 56 local farmers, first condensing it and then mixing it with the cocoa. They boast that other chocolate manufacturers use milk powder instead of slightly condensed milk and this makes all the taste difference. As we leave the factory, we're invited to write down what we think of the tour. The tasting room is set up as a gourmet taste experience, expertly catered for the individual by an attentive employee who encourages us to try new things. I appreciate being able to taste each of the assorted chocolate shapes. The girls discover which ones they like (and when they don't like one, I eat the remainder). 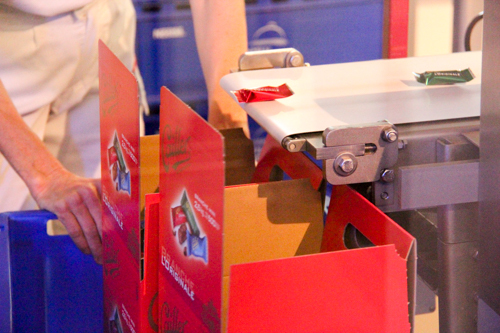 It was handy to have read all the ingredient lists beforehand — I know just which chocolates to offer to Brioni! We left the tour feeling a little ill. There is definitely something as too much chocolate, and perhaps the higher percentage of cocoa meant that this chocolate was stronger (or maybe I’m just getting old). 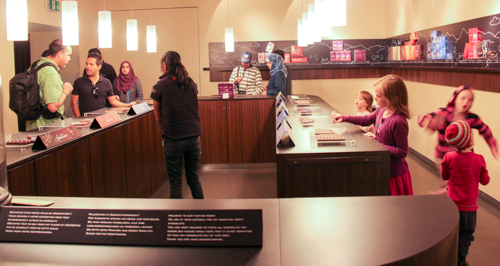 Before re-entering the foyer/gift-shop, we passed workshop rooms where classes in chocolate-making are held. That would be fun to do (or — considering the Nestlé thing — maybe not). 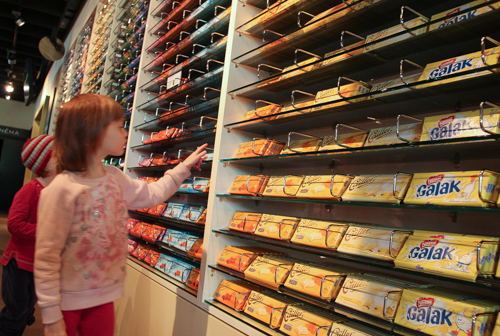 We exited through the gift-shop, but not before each choosing a chocolate bar for ourselves. My favourite is white chocolate with rice bubbles in it. Outside, in the sunshine, with all that sugar coursing through their veins, it was time for the girls to play again! 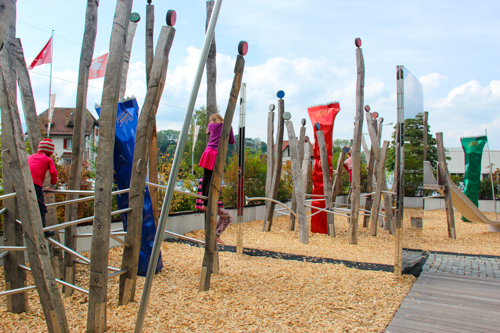 The playground is arranged like an obstacle course and decorated with huge replicas of the chocolate branches I've eaten too many of. 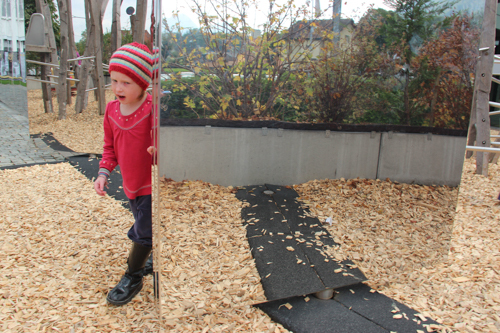 Huge, rectangular mirrors pivot on a centre pole, changing the look of the whole game-space. 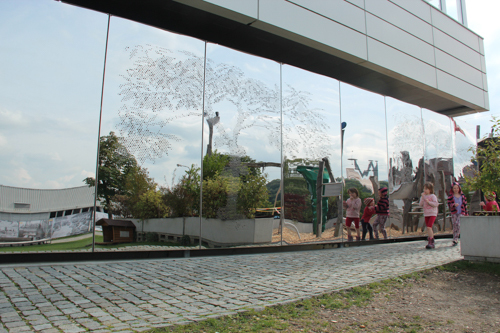 Large mirrored panes with a pointillism tree decorate the exterior of the building. I didn't notice this before on our approach to the factory. It’s possible that we spent equal amounts of time inside and outside Maison Cailler. As a memorable experience, I’d rate it highly, although the history tour wasn’t nearly as good as at the glass factory. 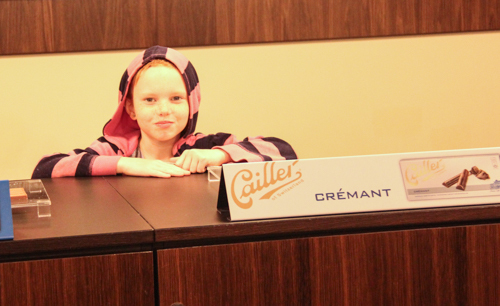 But for the Nestlé-ownership thing, I’d recommend Maison Cailler. So it’s a tricky one; consider the implications and decide what is right for your family.